WASHINGTON — Two years ago, some of America’s largest corporations were tearing up their business plans to accommodate President Trump, fearful that he could send their shareholders and customers fleeing with a tweet. Now they have a new strategy: Ignore him. This week, General Motors became the latest recipient of a barrage of tweets from Mr. Trump, who is angry about the company’s closing of a plant in Lordstown, Ohio. The president told the company to reopen the plant or sell it “fast” to someone who would. He suggested that G.M. shutter a factory in China or Mexico instead. G.M. has not budged. After Mr. Trump’s tweets over the weekend, the company issued a terse statement noting that it was relocating workers and that it would be discussing plant closings with the United Auto Workers union. It made no mention of the demands of Mr. Trump. In the past, G.M. has blamed the president’s trade war, including tariffs on steel and aluminum, for raising the company’s costs. 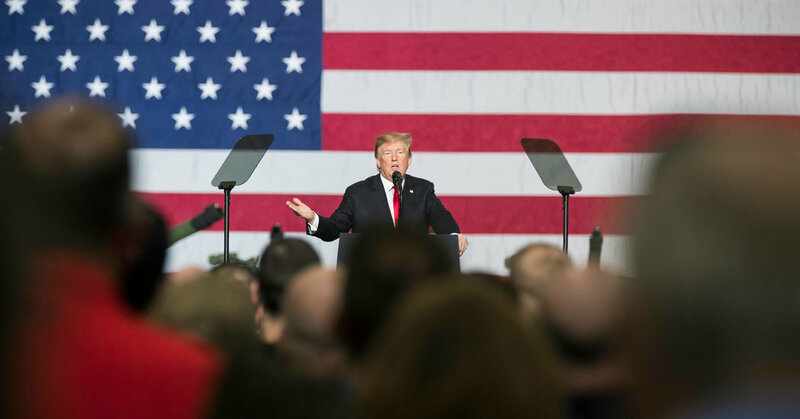 When Mr. Trump was running for president, he promised to personally stop American companies from shutting down factories and moving plants abroad, warning that he would punish them with public backlash and higher taxes. Many companies scrambled to respond to his Twitter attacks, announcing jobs and investments in the United States — several of which never materialized. But despite Mr. Trump’s efforts to compel companies to build and hire, they appear to be increasingly prioritizing their balance sheets over political backlash. Early on, Mr. Trump’s ability to direct outrage at companies appeared to work. Before Mr. Trump even took office, Carrier agreed to keep 1,000 jobs in Indiana that it had been planning to move to Mexico. In 2017, Ford canceled plans to build a new factory in Mexico and increased its investment in a self-driving car plant in Michigan. Last year, Pfizer delayed drug price increases at Mr. Trump’s request after he threatened, vaguely, to take action against the industry’s pricing policies. More recently that influence has waned. The president’s scattershot attention span has diminished his power to persuade the business world to bend to his will, corporate communications experts say, as once fearsome tweet storms have devolved into ephemeral annoyances. At the start of the Trump administration, big companies hired firms like Mr. Grabowski’s to develop response strategies in the event they were targeted by Mr. Trump. His team would scour social media to understand the trajectory of Mr. Trump’s tweets and how much damage they could do to a brand. Ultimately the public relations problems usually proved to be short lived. That congestion has been on display this week, as Mr. Trump assailed Facebook, Google, Twitter and “Saturday Night Live,” saying they are biased against Republicans. Those outbursts on Twitter were interspersed with attacks on political opponents, the Russia investigation and Senator John McCain, who died last year. While a tweet from Mr. Trump used to sink a company’s stock price, analysts say that these days a missive from the president’s Twitter feed merely injects a bit of noise into the market. Musings from Mr. Trump about the prospect of a trade deal with China or the Federal Reserve continue to rattle investors. Responding with restraint has been something of a reorientation for the public relations industry. The traditional playbook often entails responding directly, quickly and forcefully to bad publicity. However, when it comes to Mr. Trump, experts say an understated response that does not further agitate the president tends to be more effective. Mr. Trump’s power over companies started to show signs of slipping last year. After Harley-Davidson announced plans to move some of its production overseas in response to Mr. Trump’s trade war, the president repeatedly blasted the company as disloyal and urged his supporters — many of whom ride motorcycles — to consider a boycott. Harley-Davidson executives acknowledged the president’s disappointment, but pressed ahead with their plans. Another frequent target, Amazon and its chief executive, Jeff Bezos, has largely met his criticism with silence. In 2018, the president accused Amazon of pulling a “scam” on the United States Postal Service and convened a task force to come up with ways to overhaul the Postal Service business model that would allow it to charge higher rates. The task force’s report, which was released nearly eight months after the complaints, found that commercial package delivery for Amazon and other e-commerce retailers was actually profitable for the Postal Service and was not costing the United States “massive amounts of money,” as Mr. Trump had suggested in his tweets. Since then, the president has focused his attention on Mr. Bezos’ marital problems. In other cases, delay has been the path of least resistance. Pfizer agreed last summer to put off planned price increases after its chief executive, Ian Read, had an “extensive” call with Mr. Trump, who had said on Twitter that drug companies are taking advantage of the poor. In January, however, Pfizer moved forward with price increases on 41 drugs. Mr. Trump lamented on Twitter that month that drug companies were not living up to their commitments on pricing, but has not taken any action against the industry. Mr. Trump’s deal with Carrier has also been a bit less than advertised. While United Technologies, its parent company, agreed to maintain its Indianapolis factory in 2016, it still cut more than 500 manufacturing jobs in 2017 and 2018. Many of those were shifted to Mexico. So far, Mr. Trump has been mum. And Ford won plaudits from Mr. Trump for investing in Michigan, but after the spotlight moved on, it had second thoughts about abandoning its Mexico investment. Instead of canceling plans to set up shop south of the border, the company said that it would assemble electric cars there, in addition to its Michigan investment. For some companies, living up to the promises made to Mr. Trump has gotten complicated. Foxconn, the Taiwanese consumer electronics giant, won praise from the president when it announced that it would build a $10 billion television screen production plant in Wisconsin. In January, Foxconn appeared to hedge on that commitment, suggesting that it was too expensive to build the screens in the United States and that the plant would be less focused on manufacturing than it had initially suggested. After Mr. Trump had a conversation with the chairman of Foxconn last month, the company said that it was moving forward with its plans for the factory, but that only a quarter of the 13,000 people it planned to staff it would be focused on manufacturing. Despite Mr. Trump’s vast media presence and his popularity among Republicans, he has not demonstrated the ability to do lasting damage to a corporate brand that crosses him. Mr. Houchois, the Jefferies analyst, said he was not surprised that G.M. was sticking to its plan despite Mr. Trump’s displeasure. Broader economic forces, such as lower gas prices and falling demand for small cars, compelled the company to abandon the Lordstown plant. And Mr. Trump’s metals tariffs, combined with the possibility of more levies on automobiles, have been a drag on the industry and made car companies less inclined to do the president any favors.